The Highpoint is situated in between the Commercial Quarter and the bourgeoning Liverpool Waters district. This iconic development features world-class design and stunning Private Rented Sector apartments, looking toward the River Mersey. Its close proximity to the city centre, world-famous sports venues, and historic landmarks creates the perfect location for high city living. The Highpoint is a new standard of luxurious living in the heart of Liverpool. all within arm's reach, with bus stops no more than five minutes away. 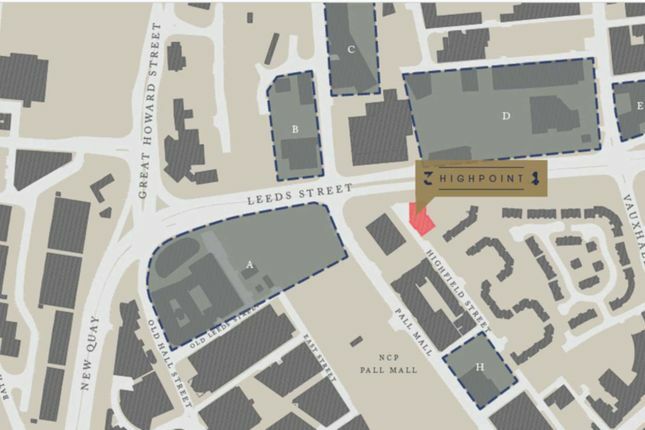 The site benefits from its connectivity to arterial ring roads, connecting Highpoint to Liverpool City Centre and beyond, without the need to meander through cryptic streets. The ferry is also just around the corner, leading towards Birkenhead, as well as river cruises allowing visitors to admire Liverpool's iconic skyline. This development may vary in the size depending on which option deems the most preferable. Its design allows the tower to range between 17,20, and 26 storeys, based upon corresponding approval schemes. The typical floor has two design schemes, one with 10 units per floor, and the other having 8. Please note we have not tested any apparatus, fixtures, fittings, or services. Interested parties must undertake their own research into the working order of these items. All measurements are approximate and photographs provided for guidance only. Property descriptions and related information displayed on this page, with the exclusion of Running Costs data, are marketing materials provided by SK Real Estate, and do not constitute property particulars. Please contact SK Real Estate for full details and further information. The Running Costs data displayed on this page are provided by PrimeLocation to give an indication of potential running costs based on various data sources. PrimeLocation does not warrant or accept any responsibility for the accuracy or completeness of the property descriptions, related information or Running Costs data provided here.